and their production continued to climb as the German production faltered. could put up a barrage from thirty-six barrels carried on the back of a truck. 76.2mm F-22 field gun) captured in the early days of the Stalin suicidal army attacks. German 75mm PaK 40 field gun and modern long barreled Pz-IV's. might have one round per gun... or even less. rocketry. 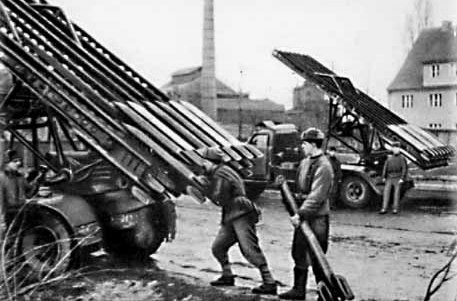 The Nebelwerfer was copied from Katyusha. gun. Special antitank gun - 8,8-cm PaK43 - was introduced in later 1943.